RICHARD, MARCEL-FRANÇOIS, Roman Catholic priest and educator; b. 9 April 1847 in Saint-Louis-de-Kent, N.B., son of Pierre-Luc Richard, a farmer, and Marie-Tharsile Bariault; d. 18 June 1915 in Rogersville, N.B. Marcel-François Richard attended the local public schools and in 1861 entered St Dunstan’s College in Charlottetown, which was the only institution in the Maritimes that offered the classical program of studies until the founding in 1864 of the College of St Joseph at Memramcook, N.B. [see Camille Lefebvre*]. He graduated in 1867 and went on to study theology at the Grand Séminaire de Montréal. On 31 July 1870, at the age of 23, he was ordained to the priesthood in Charlottetown by the bishop of the diocese, Peter McIntyre*. He was appointed curate to his native parish of Saint-Louis-de-Kent in August 1870 and four months later became its curé, with responsibility for a number of neighbouring missions. 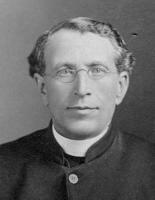 He remained there until Bishop James Rogers* of Chatham transferred him to the Rogersville mission in 1885. During his stay at Saint-Louis-de-Kent, Richard took a particular interest in education. Wishing for a convent to “educate nuns, women teachers, and Christian women,” in 1874 he invited the Congregation of Notre-Dame in Montreal to come into his parish. Seven years later the nuns, along with some 40 students, moved into a new, larger building that Abbé Richard had had built. In 1899 there would be 60 to 70 boarders and a good many day pupils. He would open another convent, for the Daughters of Jesus, at Rogersville in 1904. Richard was especially concerned about the education of Acadian boys. For them in 1874 he founded the Académie de Saint-Louis, a bilingual school with a preparatory and a commercial course. Three years later it became the Collège Saint-Louis, and offered a classical course as well. He served as its superior and Abbé Eugène-Raymond Biron as its principal. During the early years it had an enrolment of about 50. Later this number doubled, and the classical course was taught mainly in French. The increasingly francophone nature of the school gave rise to numerous discussions between Richard and his bishop. At a public meeting held there on 5 July 1882, Rogers announced that he was dissatisfied with the college’s administration and was withdrawing his support from it. Abbé Biron, who in the bishop’s view was the source of the problems, was sent back to France. Richard tried to find another principal and keep his school open, but without success. In a letter to Rogers on 19 Nov. 1882, he announced that the institution was closing. The decision, however, did not end the differences between Richard and his bishop. Richard would carry on a long correspondence with the Holy See on this subject, through the cardinal prefect of Propaganda. In 1892 the cardinal informed Richard that his complaints about his bishop’s conduct towards him had been found groundless. He urged him to submit in obedience and respect. Apart from education, agricultural colonization was one of Richard’s interests, and he worked in this field for the benefit of New Brunswick Acadians. Accorded a high priority in the program of the Acadian nationalists of the time, rural settlement was seen as a protection against emigration, especially to the United States, but above all as the foundation on which the collective economic future of the Acadians would be built. For Richard, colonization was both a means of spreading Catholicism and a demonstration of the Acadians’ affection for their adopted country, the Maritime provinces, as well as a way of bringing pressure to bear on provincial governments that were slow to grant public lands to the country’s settlers. Strategies for furthering the cause of rural colonization were often determined at national congresses. During the Convention Nationale des Canadiens Français at Quebec in 1880, the Acadian delegates passed a resolution to set up a colonization society in every francophone parish in the Maritimes. The following year in Memramcook, at the first Convention Nationale des Acadiens, a central association called the Société de Colonisation Acadienne-Française was created. 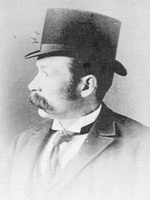 Richard was very active in the Saint-Louis-de-Kent and Rogersville branches of the society, and served as president and treasurer of the central body from 1884 to 1890. Generally considered to have founded the parishes of Acadieville and Rogersville, he also took part in numerous projects to build churches and schools. Richard was one of those who played an important part in defining Acadian nationalist thinking in the late 19th century. Nationalist strategies were determined principally at the national conventions held in Memramcook (1881), Miscouche, P.E.I. (1884), and Church Point, N.S. (1890). Richard’s role in the deliberations on the tactics that should be adopted to ensure “Acadian survival,” as it was defined by the lay and religious leaders of the time and the historians who came after them, was by no means insignificant. During the first national convention, backed by François-Xavier Cormier*, Stanislas-Joseph Doucet, and others, Richard engaged in a rather acrimonious debate on the date of the Acadian national holiday. He favoured 15 August, Assumption day, rather than 24 June, the feast of St John the Baptist, which was widely recognized as the national holiday of French Canadians and which had been proposed by Pierre-Amand Landry and Philéas-Frédéric Bourgeois, among others. In the end, his choice prevailed. It seems that, unlike Landry, Richard did not believe the Acadians had to join with the larger French-speaking community in order to attain their objectives. In 1884, at the second national convention, he introduced a flag he had had made – a French tricolour, with a star in papal colours in the blue segment, representing devotion to the Virgin Mary – and successfully proposed that it become the Acadian national flag. He was also responsible in 1884 for the choice of “Ave maris stella” as the Acadian national anthem. Richard’s actions went beyond symbols and nationalist speeches. He participated actively in the nationalist debates that went on in connection with the conventions, and he worked to promote Acadian newspapers, agricultural colonization, education, and above all the appointment of Acadians as bishops in the Maritime provinces. This last concern took him to Rome three times: he presented his requests to Pope Pius IX in 1877 and Pope Pius X in 1907–8 and 1910. Aware of the divisions that would be created by the appointment of an Acadian bishop in an existing diocese, he had proposed in 1900 that a new one be created, embracing the counties of Westmorland and Kent, the civil parishes of Carleton County, and a part of Northumberland County, with the cathedral and see in Moncton. On 12 Nov. 1907 Monsignor Richard – he had been appointed domestic prelate by the pope in 1905 – maintained that during an audience with Pius X, the pope had “approved at once the plan for a new diocese to reward the Acadians.” During a third audience, on 3 Jan. 1908, the pope promised the mitre would go to an Acadian. The proposals submitted by Richard and other Acadian nationalists to ensure Acadian representation within the Maritime episcopacy and create a new diocese with an Acadian bishop triggered a rather hostile reaction from the English-speaking Catholic bishops in the Maritimes; they feared that a narrow nationalism based on language and contrary to the interests of the Roman Catholic Church would develop. When the Holy See decided in 1912 to elevate an Acadian to the episcopate, in the diocese of Saint John, the choice did not fall on Richard but on Abbé Édouard-Alfred Le Blanc*, an Acadian not linked with nationalist demands. An Acadian diocese (the archdiocese of Moncton) would not be created until 1936, more than 20 years after Richard’s death. Priest and promoter of education and colonization, Marcel-François Richard carved out a role as champion of Acadian rights in the Maritime provinces. Wholly devoted to the cause of Acadian survival, he could not help occasionally imposing his own ideas, sometimes giving the impression of stubbornness. In his view, however, it was simply a matter of furthering the cause. Generally recognized as the greatest Acadian nationalist of the 19th century, he was buried in Rogersville, beneath the Monument de l’Assomption that he had had erected. Archivio della Propaganda Fide (Rome), Acta, 1882, vols.23, 28, 32; Nuova serie; Scritture riferite nei Congressi, America settentrionale. Archivio Segreto Vaticano (Rome), Delegazione apostolica del Canadà, 113.1, 178.111. Centre d’Études Acadiennes, Univ. de Moncton, N.-B., Fonds C.-A. Doucet; Fonds M.-F. Richard; Rogersville, N.-B., RBMS (mfm.). L’Évangéline (Moncton), 10 août 1932. La Minerve, 18 nov. 1884. 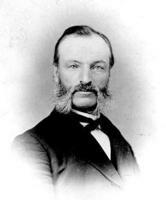 S. M. Andrew, The development of élites in Acadian New Brunswick, 1861–1881 (Montreal and Kingston, Ont., 1997). Antoine Bernard, Histoire de la survivance acadienne, 1755–1935 (Montréal, 1935). Conventions Nationales des Acadiens, Recueil de travaux et délibérations des six premières conventions, F.-J. Robidoux, compil. (Shédiac, N.-B., 1907). L.-C. Daigle, Histoire de Saint-Louis-de-Kent: cent cinquante ans de vie paroissiale française en Acadie nouvelle (Moncton, 1948). C.-A. Doucet, Une étoile s’est levée en Acadie ([Rogersville], 1973). Frère M. Guildas [J.-M. Robert], Mgr M.-F. Richard, prélat domestique: sa vie et ses œuvres (Moncton, 1940). P. [E.] LeBlanc, “Le Courrier des provinces maritimes et son influence sur la société acadienne, 1885–1963” (thèse de ma, univ. de Moncton, 1978), esp. c.2; “The Vatican and the Roman Catholic Church in Atlantic Canada: policies regarding ethnicity and language, 1878–1922,” in Papal diplomacy in the modern age, ed. P. C. Kent and J. F. Pollard (Westport, Conn., and London, 1994), 65–74. Roberto Perin, Rome in Canada: the Vatican and Canadian affairs in the late Victorian age (Toronto, 1990). [F.-E.] Rameau de Saint-Père, Une colonie féodale en Amérique: l’Acadie (1604–1881) (2v., Paris et Montréal, 1889). Robert Rumilly, Histoire des Acadiens (2v., Montréal, 1955). Phyllis E. LeBlanc, “RICHARD, MARCEL-FRANÇOIS,” in Dictionary of Canadian Biography, vol. 14, University of Toronto/Université Laval, 2003–, accessed April 20, 2019, http://www.biographi.ca/en/bio/richard_marcel_francois_14E.html.